I arrived early at McCarran Airport in Las Vegas to return to Houston knowing that I would run into others from the convention who were returning home, too. No sooner than I had passed the friendly “pat down” from TSA (at no extra charge unlike other places in Las Vegas where they do charge extra for touching), and before I reached the gate, I ran into Fred King from southern California. Fred is a long time listener, first time caller to The Magic Word. Many times he has offered me a glass of scotch as a “thank you” for me providing this free podcast, but there was never an opportune time; however, now we had nothing but time before our flights. So we retired to the bar and settled into a glass of Glenfiddich (it was the only single malt they had) as we discussed and reviewed the convention with particular emphasis on the Wednesday events. The YouTube video in this blog of The Great Tomsoni and Company's final performance was captured by Joe Turner on his cell phone. Hence the poor recording quality of this historic event. The second video in this blog was taken and posted by collegeofmagic at the end of Johnny and Pam's final performance. It shows Lance Burton plus Penn and Teller honoring Johnny and Pam Thompson for all their years of friendship and creativity to their own acts plus the magic community in general. You have no doubt followed my posts during this week so you know what I have been up to each day. And as mentioned it was a fabulous convention, unlike other magic events. I read a tweet from one attendee who said something to the effect, “I have never learned so much magic at one convention but I haven’t learned one trick.” Well tweeted, my friend. As I arrived home to Houston, I was pleased to spend the evening with our Scottish friend and magician (who now resides in Wales), John McGrath. He was over this week on business. He arrived just about the time I left for Las Vegas and will return home on Friday. So Thursday was the only night we could get together. He and his wife, Debs, and their children hosted us for many nights in between my lecture dates whilst I was in the U.K. on tour this past May. I understand that Banachek’s taping for the Japanese network went well earlier this week here in Houston. We are exchanging locations: as I arrive in Houston, he will be heading to Las Vegas. As you may have heard in my little clip with Criss Angel, they will be shooting an episode with basketball great, Shaquille O’Neil for Criss’ upcoming series on Spike TV. And this Saturday night, David Rangel will be performing a one man close-up show at the Hilton Americas here in Houston. David is also the main house magician at Tokyohanas Grill and Sushi Bar on Thursdays and Saturdays. Next Saturday night, August 24th, Jamie Salinas will perform and host a magic show in Bay Town, TX called "Champions of Magic" featuring the award winning magic and dancing duet “The Rhythm of Magic”, Michael and Jessica Blanco. As for me, I don’t know how much I will be able to type next week as I will be having hand surgery for carpal tunnel syndrome on my right hand next Thursday the 22nd. That may keep me off the computer for a while. But I plan to quickly do some rehabilitation on my hand with playing cards. I just hope it won’t affect next week’s Magic & Martini Thursday. 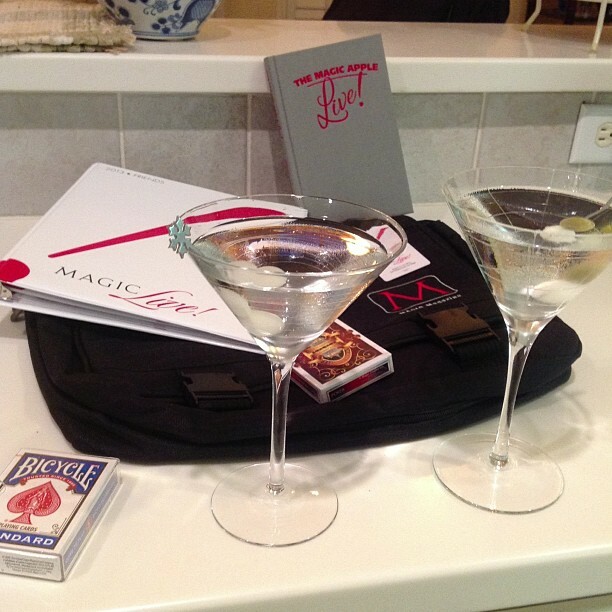 Magic & Martinis Thursday after returning home from MAGIC Live! in time to enjoy the evening with my mate who is visiting from Scotland, John McGrath. Tagged with Fred King, MAGIC Live, Penn & Teller, Lance Burton, John McGrath, David Rangel, Rhythm of Magic, Michael Blanco, Jessica Blanco, Champions of Magic, Banachek. August 16, 2013 by Scott Wells.